While the Gandhis and Bhuttos may lay claim to being among the most notable political dynasties in the world, there really is no one like the Kennedys. They had it all: intrigue, glamour, triumph and tragedy, and the fascination with their clan continues to this day. On television, episodes of 1960s advertising drama Mad Men have featured reactions to the assassinations of both president John in ’63 and ex-attorney general Bobby in ’68. And in 2011, a controversial BBC mini-series entitled simply The Kennedys starred Greg Kinnear as JFK, Katie Holmes as Jackie, and Tom Wilkinson as Joseph P Kennedy Snr. The father of the murdered president is the focus of this FoP event, with US historian David Nasaw in town to introduce his biography, The Patriarch: The Remarkable Life and Turbulent Times of Joseph P Kennedy­. Something of a ‘colourful character’, Kennedy flew to Scotland in an attempt to secure whisky deals for Americans in the aftermath of Prohibition, and was US ambassador to the UK until being forced to resign after making comments in 1940 about democracy being finished in the west. His ambition to become the first Catholic US president disintegrated, but he outlived the son who attained that honour, finally dying in 1969 eight years after suffering a major stroke. In fiction, though, Joe Kennedy’s dreams reached some kind of strange fulfilment. Robert Harris’ alternative history drama Fatherland features him in 1964 as the US leader meeting with a very-much-alive Hitler, the Greater Germany Reich führer. Nasaw deals a bit more in the real world, and received high praise from Christopher Hitchens for his 2006 biography of Andrew Carnegie, while Ted Kennedy approached him to write this memoir of his father. The result is a hefty tome which dissects the good, bad and ugly elements of this patriarch’s life and work. The Kennedys, Scottish Parliament, Holyrood Road, 0131 348 5200, 25 Aug, 2pm, £5 (£3.50). 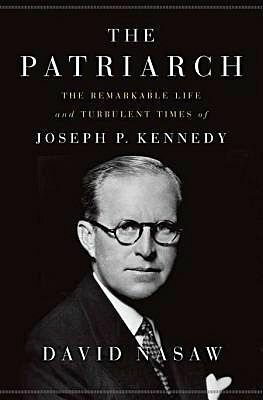 Joseph P Kennedy's biographer talks about the Kennedy dynasty.